When it comes to emotional crises, the most difficult advice to receive and follow are those dealing with more practical matters. As a Family Law Attorney, it’s challenging. There’s a client in front of you, you learn the most intimate (and difficult) details of a person’s failing marriage, and along with sympathizing with their situation, it’s also necessary to set ground rules to help make this transitional time easier. This advice is not going to make the stress and difficulties of an ongoing divorce disappear, and it isn’t meant to. But for many clients, when their attorney is willing to help with the smaller details, it hedges some of the larger problems from ever arising. It’s amazing how a small thing like a notebook can make the difference during this process. A notebook, which is meant to be passed between parents, should contain up-to-date information regarding the child’s life. No one can be expected to recall every little detail that happens with their children on a day-to-day basis. That’s why a notebook is so important as it provides helpful reminders to ensure that important dates, appointments and other information is properly communicated to the other parent at the next moment of contact. Health – Doctor’s visits, Doctor changes, and new medications. School – Communication with teachers, upcoming projects, or any disciplinary actions. Social – Times for phone usage, using the computer, playing games, and their limits to each one (especially for disciplinary reasons). 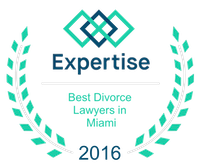 Yes, many couples find it challenging to work collaboratively with each other after, or while, dealing with a problematic divorce. But that must be set aside. Children must know that they have stability at home, no matter which home that might be. Maintaining consistency and a routine for children during this difficult time should be a priority for both parents. Of course, that doesn’t mean that parenting disagreements can’t or won’t happen. But when such disagreements do arise, it is vital to discuss them in private, away from the children, and to otherwise shield them from the divorce process to the fullest extent possible. There may be room for this while parents are married, but after a divorce, this can only unsettle the child and create problems for the stricter parent. It is incredibly unfair for one parent to be on the receiving end of “but Mommy/Daddy lets me do it…” This places the child in the middle of an on-going battle between parents, and can only lead to future behavioral issues.